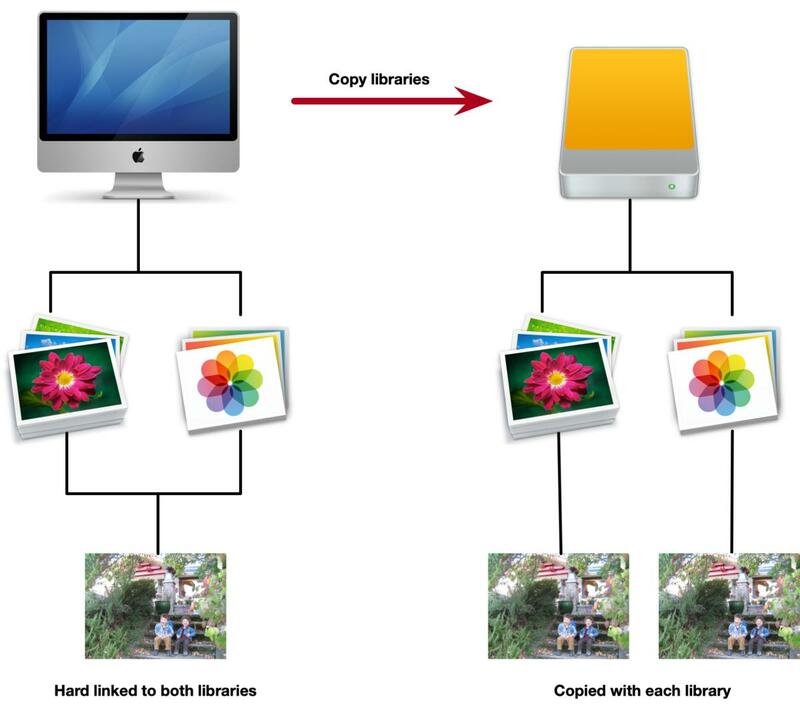 The “hard link” approach Apple uses to reduce storage doesn’t survive a copy operation. When you have an older iPhoto library and a newer Photos library on your Mac and you copy both libraries to an external drive, you might notice that they collectively occupy a lot more space than they do on an internal drive. Why is that? It comes down to hard links, a way of conserving storage. This works perfectly with both iPhoto and Photos, which never modify an original stored image, but create a modified version or record a set of changes stored separately. The original is retained and can be exported in either app. If you switched entirely to Photos, you’d have a mix of hard-linked files in the Photos library and newly imported images found just in that library. Photos also uniquely creates its own thumbnails and other files. So long as the iPhoto and Photos libraries remain on the same drive, all space occupied by original, unmodified images that are present in both libraries occupy just one unit of space. The moment you copy either library to another drive, that hard link is broken, as each file referenced has to be copied uniquely: hard links don’t pass across volumes. Hard links are broken and files copied individually across volumes. Thus, if you copy both your iPhoto library and Photos library to an external volume, each identical unmodified image shared between them shifts from one unit of storage to two units of storage—if that’s 100GB of shared original images, another 100GB of storage is required at the destination. This Mac 911 article is in response to a question submitted by Macworld reader Peter.